A major tier-1 automotive supplier required workholding fixtures to machine magnesium parts for a car engine component called an inlet or intake manifold, which is a chamber that carries vaporized fuel to the inlet valves of the cylinders. 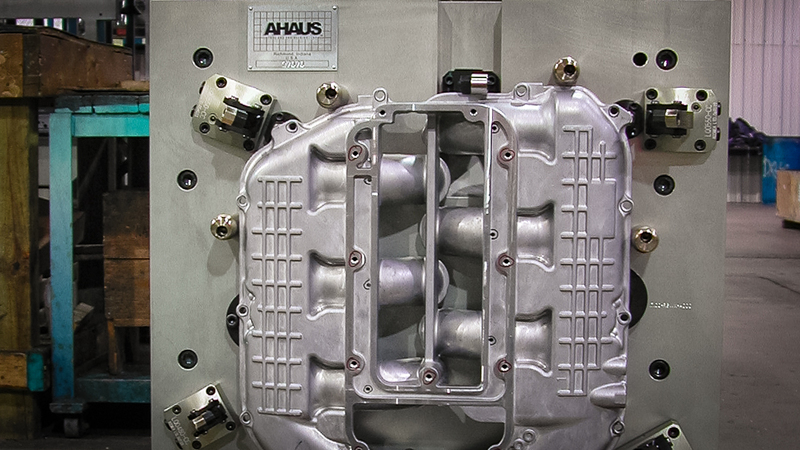 The automotive supplier needed a fixture that could hold in place the part being machined, and Ahaus has been a leading provider of workholding solutions for more than two decades. But there was a catch — the part being machined was made of magnesium, a highly reactive and flammable metal. The shavings generated from the machining process are highly combustible, which presented a potential danger to the machine operator. Ahaus’ job was to design and produce a safe, reliable “no-spark” workholding fixture. Material selection for workholding fixture design is usually driven by weight restrictions, as the fixtures are mounted to machines requiring exacting precision, and this project was no different. In addition, the materials had to be non-sparking, using non-conventional contact surfaces and processes to eliminate the danger of inadvertent combustion. Ahaus worked with the customer to determine the best materials to use for the fixture. The customer provided the specified requirements for material selection based on the upstream and downstream manufacturing processes. Ahaus’ engineers ultimately selected an aluminum plate on a steel base with Delrin® acetal resin and bronze details. The custom-designed automated workholding fixture includes integrated hydraulics, sub-plates, sensors and clamps to achieve maximum productivity — and all the components are spark-proof for operator safety. The fixture was built with custom part retention, meaning it was made to the exact specifications of the part being machined, snapping the part in place to hold it there so it doesn’t move during the machining process. The device also features internally ported hydraulics; the hydraulics are hidden inside the aluminum base. Roughly 99 percent of the workholding fixtures Ahaus designs are hydraulically actuated. Ahaus Tool and Engineering has many other special options for workholding applications, working with customers every step of the way, through conceptual design, engineering, service and support to meet their specific requirements. Ahaus has been designing and building customer fixtures for the automotive, machine tool, valve, construction and other industries for more than two decades. Our capabilities include: engineering design; a dedicated fixture manufacturing group; and an assembly and tryout area. We work with machine tool manufacturers, distributors and users to meet specified requirements for positioning, placement, number of parts, deflection and machine forces. We will design the workholding fixture, check functionality, runoff and develop the process for the machinery of choice. We can bring machinery to Ahaus for a complete runoff or retrofit.